The restaurant was full and bustling. While waiting for our table we sat at the bar and had a drink. Unfortunately the bar man could not locate any tonic water for our drink, then couldn't find any mineral water or in fact any soda water, so we decided on one straight from the tap. On sitting down the atmosphere was great, busy but not so noisy that you couldn't hear the other people at your table. The waiter, and owner, was attentive and well humoured, and explained the menu and made some excellent suggestions. Classics like Pad Thai and the Green Chicken curry were excellent, and showed an amazing understanding of the balance required to cook Thai food. The waiter suggested a taste plate for entree which included fish cakes and satays, and was an excellent suggestion. The chef is all the way from Bankok and is definitely raising the bar for other restaurants attempting food in this style. On opening about a year ago, Thai Riffic was given a buddhist blessing. Phra Maha Boonsom Uttan, Head monk of the Melbourne Buddhist Temple performed the blessing to ensure good luck and prosperity. On the night we ate there the blessing seemed to be working, with every table full and a dining room full of very happy customers. 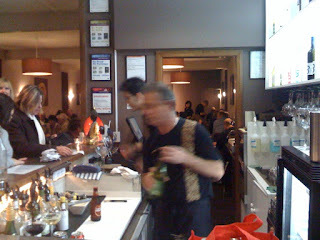 I had a great meal with my family at the Thai Riffic in Mildura a couple of weeks ago. Great innovative Thai food with the Chef hailing from Hua Hin - less well known to Aussies but one of the holiday resort areas frequented by the Thai's and also the Thai royal family. One of the best Thai meals I've ever had - inside and outside of Thailand! But glad to hear there's another Thai-riffic! restaurant that is good. It's a franchise here in Sydney.